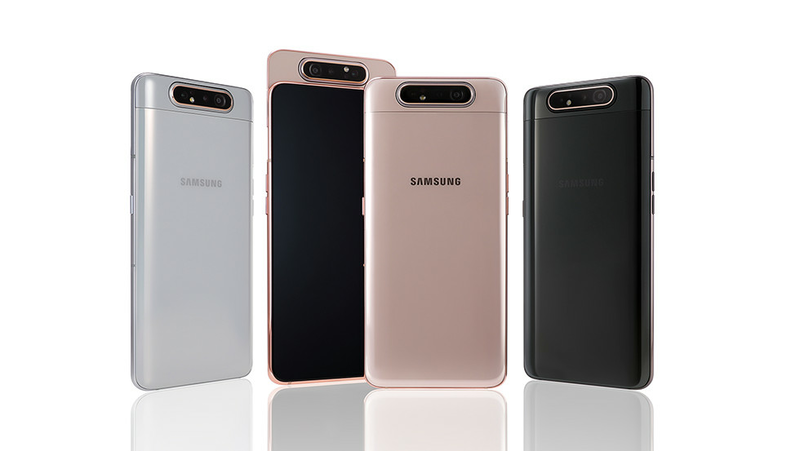 What does Samsung's new Galaxy A80 mean for flagship smartphones? Home Launches What does Samsung’s new Galaxy A80 mean for flagship smartphones? A mid-range smartphone that has better specifications than a flagship? We cannot deny the rapid emergence of value smartphones over the past few years. Sure, these have some sacrifices in camera, design and battery technology. But with Samsung’s Galaxy A-series, the South Korean manufacturer is blurring lines even further. The flagship for Samsung’s Galaxy A line-up is the Galaxy A80. And it is unlike any smartphone we have ever seen. There is no wide notch, no punch-hole nor is there a dew drop-style notch. This is the closest to an all-screen phone we have seen allowing for a massive 6.7-inch FHD+ Super AMOLED display. Its bezels are uniform throughout the device aside from a slightly wider chin to accommodate the display connector. But if this phone is for the “Era of Live” as Samsung says, where is the front selfie camera? That extra screen space on the front of the device has made for one of the best camera combinations to take your selfies. A simple tap initiates a seamless process to flip the primary camera around. And with a 48MP Sony sensor, an 8MP wide-angle and a 3D depth-sensing ToF sensor, you’re looking at some impressive specs. The notable omission is a zoom camera presumably for the Galaxy S-line to still carry some advantages. But considering the 48MP resolution on the Galaxy A80, you could still see some lossless zoom capabilities from it. Even on the video front, the A80 borrows the Galaxy S10 line-up’s Live Focus and Super Steady video modes. There is even a Live Focus in video mode and the same 30 scene recognition and optimisation scenarios that are bundled with Samsung’s flagships. If you thought the camera was impressive, wait for the specifications. While this phone is no high-end powerhouse, its 8GB RAM and 128GB of internal non-expandable memory put it well above your typical upper mid-range phone. The phone runs on an unspecified octa-core processor clocked at 2.2GHz but we think it is one of the Exynos variety. Of course, the software on board is Android 9.0 Pie draped in Samsung’s One UI skin. There is an in-screen fingerprint scanner and a huge 3,700mAh battery in tow, again, offering a similar range to Samsung’s flagship Galaxy S10 range. In fact, a slightly lower-end Galaxy A70 eclipses this capacity offering a mammoth 4,500mAh capacity. Both these phones also come with 25W fast battery charging. End of the era of flagships? Just a quick glance at what the Galaxy A-series offers tells us that the need for flagships is slowly diminishing. These high-end phones may still have the best processing, high-resolution displays and better build quality with dedicated ingress protection. And sure enough, enthusiasts are willing to pay the extra money. But for a general consumer, it may not be worth spending the extra for these features. How many times have you genuinely noticed a pixel on a good quality FHD+ display? I’m sure its not a regular occurrence. The Galaxy A-series, on paper, definitely has huge potential. But we will have to wait and see how the phones are priced and whether they live up to their specifications in real-world usage.